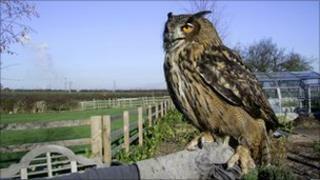 Pet owners living near a Nottinghamshire village are being warned to be on their guard after a large owl escaped. Sammy, a female European eagle owl, has a 6ft (1.8m) wingspan and is usually fed on day-old chicks. Owner Lee Ravenscroft, of East Stoke near Newark, said the bird of prey will hunt foxes and rabbits in the wild, but might also resort to cats or dogs. Sammy's mate Boudica is said to be "enjoying the peace and quiet". Mr Ravenscroft said: "Sammy is about two-and-a-half foot tall with a six-foot wingspan. Big bird. "She'll be looking for foxes, rabbits, things like that. The danger is if she goes into a village where people are walking their dogs, that's what I'm concerned about. "She's gone onto the roof a couple of times before, but she's always come back. That's just part of her training I suppose. "It's all about keeping the food down enough so they'll come back but last night I gave her a few too many." He said Boudica was "quite relaxed" despite the absence of his mate. "I think he's enjoying being by himself - the peace and quiet. Obviously Sammy's a lot bigger, twice the size, and the females can tend to be a bit more fierce than the males." Sammy has been missing since 2100 GMT on Monday. Anyone who sees a large owl in the area is asked to report the sighting to BBC Radio Nottingham.